Liberia, officially the Republic of Liberia, is a country on the west coast of Africa, bordered by Sierra Leone, Guinea, and Côte d'Ivoire. 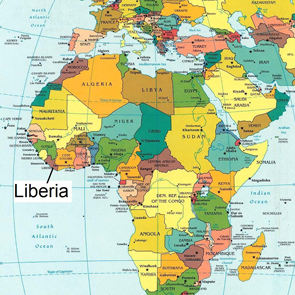 Liberia, which means "Land of the Free", was founded as an independent nation by freed-slaves from the U.S. and formerly enslaved African Americans. Recently it has witnessed two civil wars, the Liberian Civil War (1989–1996), and the Second Liberian Civil War (1999–2003), that have displaced hundreds of thousands and destroyed its economy. The founding of Liberia was privately sponsored by American religious and philanthropic groups, but the country enjoyed the support and unofficial cooperation of the United States government. Liberia’s government, modeled after that of the United States, was democratic in structure, if not always in substance. On 12 April 1980, a successful military coup was staged by a group of noncommissioned Krahn officers led by Master Sergeant Samuel Kanyon Doe, and they executed the President of nine years, William R. Tolbert, Jr., in his mansion. Calling themselves the People’s Redemption Council, Doe and his associates seized control of the government and brought an end to Africa’s ‘first republic’. In late 1989, a civil war began, and in September 1990 Doe was ousted and killed by the forces of faction leader Yormie Johnson and members of the Gio tribe. As a condition for the end of the conflict, interim president Amos Sawyer resigned in 1994, handing power to the Council of State. Prominent warlord Charles Taylor was elected as President in 1997. Taylor's brutal regime targeted several leading opposition and political activists. More than 200,000 people are estimated to have been killed in the civil wars. The conflict intensified in mid-2003, and the fighting moved into Monrovia. As the power of the government shrank and with increasing international and American pressure for him to resign, President Charles Taylor accepted an asylum offer by Nigeria. After the exile of Taylor, Gyude Bryant was appointed Chairman of the transitional government in late 2003. The primary task of the transitional government was to prepare for fair and peaceful democratic elections. With UN and ECOMOG troops safeguarding the peace, Liberia successfully conducted presidential elections in the fall of 2005. Twenty three candidates stood for the October 11, 2005 general election, with the early favorite George Weah, internationally famous footballer, UNICEF Goodwill Ambassador and member of the Kru ethnic group expected to dominate the popular vote. No candidate took the required majority in the general election, so that a run-off between the top two vote getters, Weah and Ellen Johnson Sirleaf, was necessary. The November 8, 2005 presidential runoff election was won decisively by Ellen Johnson Sirleaf. Daughter of the first indigenous Liberian to be elected to the national legislature, Ellen Johnson, Sirleaf was born in rural Liberia. Widely celebrated for being the first elected female head of state in Africa, Johnson Sirleaf’s election focused much international attention on Liberia. A former Citibank and World Bank employee, Johnson Sirleaf’s impressive career also includes heading the U.N. Development Programme for Africa. Long involved in her country’s fight for peace and justice, Johnson Sirleaf was jailed twice during the Doe administration. Jailed once for eight months, she narrowly escaped with her life before going into exile. Delivering a message of hope and reconciliation in her inauguration speech, Johnson Sirleaf hopes to bring her credentials to bear and enlist the help of the international community in rebuilding Liberia’s economy and infrastructure. 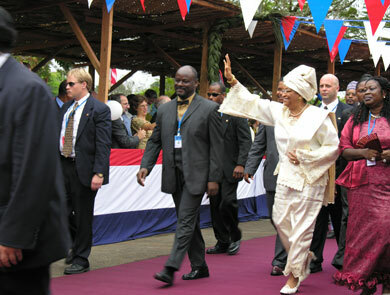 Following her inauguration on January 16, 2005, Ellen walked through the streets of Monrovia to cheerful and joyful crowds and she announced a 150 day plan and set about re-building Liberia.